A group of Russia-backed Cossack militants has been held responsible for shooting down Malaysia Airlines Boeing 777-200 flying from Amsterdam to Kuala Lumpur, near the village of Chornukhine, some 80 kilometers north-west of Donetsk. Sluzhba Bezpeky Ukrayiny, Ukraine's special purpose law enforcement agency, reportedly intercepted a phone call made at 4:40 pm Kyiv time, or 20 minutes after the plane crash, by Igor Bezler -- who the SBU says is a Russian military intelligence officer and leading commander of the self-proclaimed Donetsk People’s Republic. He reported to a person identified by Ukraine's SBU as a colonel in the main intelligence department of the general headquarters of the armed forces of the Russian Federation Vasili Geranin regarding the shot down plane, which is about to be examined by the militants. A second intercepted conversation released by the SBU was apparently between militants nicknamed "Major" and "Greek" immediately upon inspection of the crash site. Igor Bezler: Gone to search for and photograph the plane. Its smoking. Vasili Geranin: How many minutes ago? Igor Bezler: About 30 minutes ago. folks who shot down the plane. From the Chernukhin check point. Those cossacks who are based in Chernukhino. 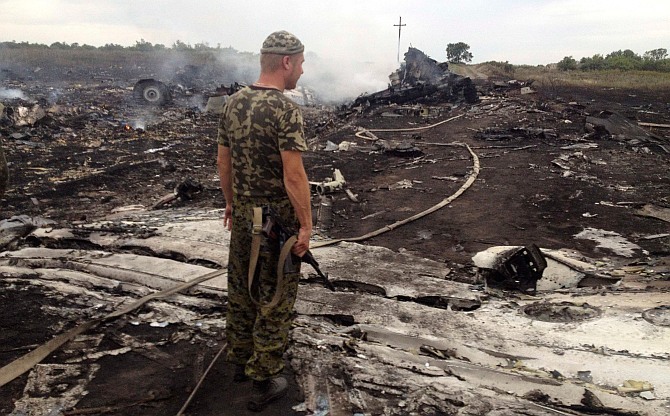 Militant: Regarding the plane shot down in the area of Snizhne-Torez. It’s a civilian one. Fell down near Grabove. There are lots of corpses of women and children. The Cossacks are out there looking at all this. They say on TV it’s AN-26 transport plane, but they say it’s written Malaysia Airlines on the plane. What was it doing on Ukraine’s territory?